The Honey Festival 2019 will take place on the 22nd and 23rd of February. 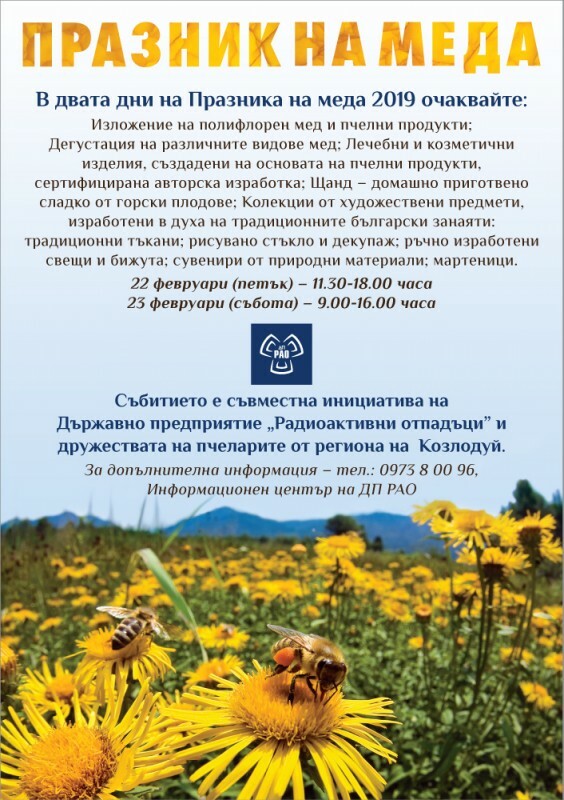 The event is a joint initiative of the State Enterprise “Radioactive Waste” and the beekeepers’ associations from the Kozloduy region. The Festival will traditionally be held in a two-day exhibition featuring bee products and various types of honey with a tasting experience. The exhibition will also offer: healing and cosmetic products made on the basis of bee products; a stand with homemade jam of wild berries; traditional fabrics; painted glass and silk; handmade candles; martenitsas and souvenirs made of natural materials. The programme scheduled for 22 February at 12.30 hrs in the “Hristo Botev – 1879″ Community Centre includes the guest speakers Martin Dimitrov and Dilyana Kostova will – fitness consultants and personal trainers, who have specific experience with people with certain diseases, for example: hashimoto, thalassemia, cardiovascular problems. The meeting with them will provide information on the useful qualities of honey as part of the nutrition programme of people with more intensive sport regimes, as well as for all those who are looking for a healthy diet.